Compact Fluorescent Lighting (CFL) offers many advantages over the standard incandescent type of light bulb. They provide the same amount of light as incandescent bulbs but use far less power, and last many times longer. Over the lifetime of a CFL bulb the electricity cost savings amount to many times the initial cost of the bulb, and carbon emissions from power stations are reduced. However, CFL bulbs are not as green as many people believe. First of all they are more complicated than incandescent bulbs requiring more materials, more processing, and therefore more energy during manufacture. Secondly, they contain electronic components – the manufacture of which requires a range of nasty chemicals, and the release into the atmosphere of dangerous heavy metals and other polution. Last and by no means least, every CFL bulb manufactured today contains not insignificant amounts of the toxic metal mercury. 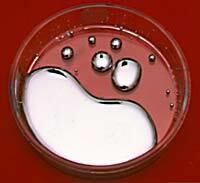 Mercury, also called quicksilver is a silver coloured metal which is liquid at room temperatures. It is a neurotoxin just like lead and is therefore extremely poisonous and damaging to humans whether it is eaten, inhaled, or is in contact with the skin. The average CFL bulb manufactured today contains 4mg of mercury. It is an essential part of CFLs without which we would not have such energy-efficient light bulbs. Although it is anything but optimal to have such a toxic material used in the manufacture of a green product, this is no reason not to replace all incandescent bulbs with CFL bulbs at home and in the office. Why? Because coal-fired power stations emit mercury – and during the average 5 year life of a CFL bulb the electricity generated to power it will have lead to smokestack emissions into the atmosphere of 2.4mg of mercury. Over the same 5 year period the electricity consumed by incandescent bulbs will result in 10mg of emissions. Therefore, even if you factor in the 4mg of mercury contained in the CFL bulb itself, the CFL is still a net winner. Ideally CFL bulbs should be recycled. During the recycling process the mercury can be recaptured and used again and so no mercury escapes into the environment. However most people simply throw their old CFL bulbs into their domestic waste where they are often broken before arriving at landfill. This puts waste collectors at risk of inhaling mercury vapour and it also escapes and ends up in the soil. If you do not have CFL recycling facilities then wrap your old CFL bulbs in a plastic bag and dispose of them as you would used batteries and other hazardous waste. 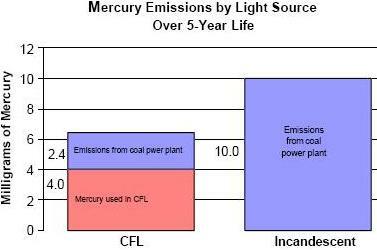 The following fact sheet entitled Mercury in Compact Fluorescent Lamps (CFLs) (PDF) was prepared by the US Environmental Protection Agency and compares mercury emissions from CFLs and incandescents over a 5-year life. It also covers in some detail the correct disposal of CFL bulbs and was the source of the chart which compared the mercury emissions of the different light bulb types.